20,000 Leagues Pokie Review - Play today! Twenty thousand leagues under the sea first came out as a book in 1870, and a film follows in 1954. Cryptologic developed this great game, which enables player the joy of a golden oldie with 5 reels and 9 paylines. The theme might be a few years older but the features are new and exciting offering free spins and wild multipliers. The jackpot is a captivating 5,000 coins. Rumours spread about a dangerous monster in the sea so the crew set off to find it and when they did the monster overpowered them. It takes them a while to realize it was no monster, in fact it was a manmade inundated boat. You can join the crew from 20 000 Leagues and experience the adventure. Settling in wont cost you much with betting starting from a low $0.05 – $5.00 with the maximum set at $45.00. 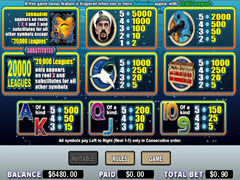 This great video slot offers memorable symbols starting with the yellow submarine and the logo of the 20,000 leagues in blue and yellow, the captain and commander of the ship, blue suited deep sea scuba diver, angry shark ready to attack and the red treasure chest over flowing with jewels. You will also see the face card symbols features in unique bubbly colours. 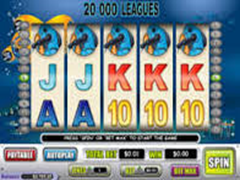 20,000 Leagues is an easy to play slot, but will offering a number of impressive features like with multipliers that appear on the reels. The 20,000 Leagues game logo wild will only come into view on the third reel, the oddly shaped orange submarine will only appear on reel 3 and double all the winnings the wild submarine completes. Both the symbols can complete combinations when they appear. When the submarine scatter appears you will also get to play the free spin feature where you will receive 10 free spins for every time the activation of the submarine symbol on the third reel. All of the payouts occurring in the free spins will be multiplied to give you double the standard payout. Each time the submarine wild symbol appears in the free spin feature you will receive an additional free spins. Cryptologic have flawlessly designed a very easy to play slot with great features that complement each aspect of the theme. With the basic slot you wouldn’t expect the amazing features and symbols the slot has to offer. Definitely an impressive slot and well worth a try.